The Nerja Parador is sited on a cliff overlooking the sea. It is an ideal setting for enjoying the coast and the beach which can be reached by a lift. The building has a splendid garden where exotic flowers bloom among the orange trees. The lush green colour of the vegetation contrasts with the blue of the swimming pool and the black and white pebbles laid in checker board fashion in the courtyards. The sunken lounge and dining room are separated by an open sided buffet where the local painted pottery is on display. The spacious and bright interior has a high level of comfort with elegant decor. It was King Alfonso XII who suggested that a Parador should be built at Nerja. He liked the area, particularly the promontory nearby which he called "Balcon de Europa", the balcony of Europe. As it was the King's wish, the Parador was built and opened here in 1930. A visit should also be made to the "Cuevas de Nerja" which are spectacular caves re-discovered in 1959. Inside there were many remains from the Paleolithic and Neolithic eras. A pathway leads you into the "Hall of Cataclysm" which is 60 metres high. Festivals of dance and music are held in this natural hall. The town of Nerja is within walking distance for those who enjoy the exercise. It has narrow streets and interesting shops. With the hotel garden fronting onto the Mediterranean sandy beaches this is the destination for most residents during the day. Besides swimming you can go diving, fishing, para gliding, go on a boat trip, hire a pedalo or a water bike. In the hotel grounds, there is a seasonal swimming pool and a tennis court. Reception can also arrange horse riding nearby. A visit should also be made to the nearby marina constructed in a rocky bay and now surrounded by elegant shops and cafes. In the hill top garden of the Parador there is a children's playground and, of course, the seasonal swimming pool. Parador Nerja has eighty two twin bedded rooms, twelve rooms with double beds, two suites and two easy access rooms. All the rooms have a private bathroom. All rooms also have a telephone, satellite television, safe and a mini-bar. The bedrooms in the original building all have balconies whilst those in the newer wing have patios. The hotel has air conditioning and central heating. There is a gift shop, currency exchange, lift, parking facilities (without security and limited places), satellite television, piped music, free wireless internet, garden, restaurant and a bar. Facilities are available for business meetings. 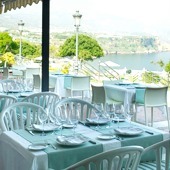 If this Parador of Nerja is full, click here for alternative hotels in Nerja. Distance from the nearest airport is approximately 70 kms, train station is 55 kms away and the nearest port is 55 kms away. We enjoyed a lovely week at the Parador in Nerja. Our room had a beautiful view. Our only constructive criticism would be that the bathroom need updating as the area around the bath/shower was black with mould. This had nothing to do with the excellent cleaning staff; the bathrooms are simply old. At breakfast, the staff were very friendly but there needs to be more staff at peak times as there were often tables not cleared and breakfast was a bit chaotic. All the staff were e trembly friendly; you just need more of them! The swimming pool was a joy and the garden very peaceful. We will definitely return again as we enjoy staying in Paradors. Charming Parador hotel, the room was lovely with good size balcony overlooking the sea and the beach. Very good idea with the lift from the hotel to the beach. we hope to return many more times Nerja itself is very nice. I would recommend both the hotel and the town of Nerja to anyone who asks. Parador hotel of Nerja is above the Mediterranean beach of this town in Andalucia.